Thank you for visiting my web site. 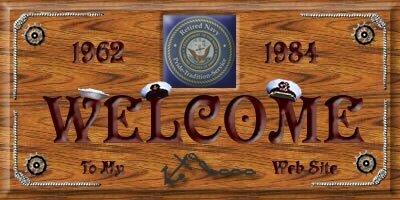 This web site depicts a chronological listing of all my duty stations during a U.S. Navy career that spanned 22-years. This site includes some of my experiences, some funny stories, and many photos covering this 22-year period. I have a saying that I use to sum up my Navy career, and that is "I went in and I just forgot to get out!" The Navy just kept dangling that carrot out in front of me and I kept chasing it. Since I was only 17 when I first enlisted, my initial enlistment was what they called a kiddie cruise (3-yr, 9-mo). At that time, if you were under 18, your initial enlistment could only last until you reached 21 years of age. The Auxiliary Navy - served on board the Repair Ship USS Klondike AR-22, my first ship and a good one to start with. Where I got my first WestPac under my belt. The Gator Navy - served on board the Amphibious Troop Transport USS Bexar APA-237, which I could sum up as my worst tour of sea duty. Fortunately, I was able to escape from the Gator Navy by exercising a clause in my re-enlistment contract to attend Electronics "B" School. I don't believe I would have made a career out of the Navy had I stayed locked into Gator Navy duty. The Submarine Navy - served on board the Fast Attack Submarine USS L. Mendel Rivers SSN-686, where I learned teamwork, camaraderie, and many of my management skills. But, not being able to breathe fresh air, standing watches (6hrs-on & 6hrs-off), and spending very little time at home was something I dreaded. 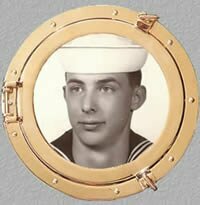 Having said that, I'm very glad that I volunteered for Submarine Duty (even as an E-7), the education and experience I received was immeasurable. The Cruiser Navy - served on board the USS Chicago CG-11, the best ship I ever served on. Although I didn't realize it until later in my career. The Destroyer Navy - served on board the USS Robison DDG-12, the ship that drove me to retire from the Navy. 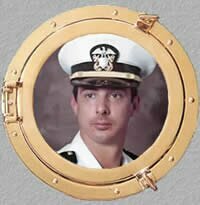 It would have more challenging and rewarding had I gone aboard the Robison, as a new Warrant Officer, prior to the Chicago. Shore Duty - served in the capacity as an Instructor at Advanced Electronics "B" School Treasure Island, the best and most rewarding tour of duty in my career. Served as AOIC of Navy Tactical Interoperability Support Activity NTISA Detachment One North Island, where I had so much spare time on my hands that I was able to attend college at night and eventually obtain a BBA and MBA degree in Information Systems. Also, my first tour of duty in the Navy was 1-year at the Pacific Reserve Fleet Stockton, which I didn't appreciate at the time. I just wanted to go to sea. Was I a little naive or what! Schools - attended the 2-year Associate Degree Completion Program ADCOP, which got me started in pursuing higher level education. In addition, I was able to attend 52-weeks of Electronics "A" School, 48-weeks of Advanced Electronics "B" School, 26-weeks of SINS School, 4-weeks of Instructor School, and many various electronic equipment and management skills courses. I was no war hero, just an average bluejacket. You can tell by my salad (as some refer to their ribbons/medals) depicted above - the usual fare handed out at the time. I was never awarded a Navy Achievement Medal or Navy Commendation Medal - I think I came close a couple times, but made a bad decision on one occasion and the other time I believe I was victim to the classic old adage "one ah-sh** cancels ten atta-boys." I did receive several letters of commendations and appreciation throughout my career. As to some discipline problems early in my career, a couple old Boatswain Mates, were very persuasive in guiding me back on track. This after a few attitude adjustments, like putting a size ten up by backside and a few knots on my head. I was only written up once in my career, and I had to go to XO's mast. This was at my first duty station, and I was written up for fighting. The XO dismissed the charge after I helped him chase a wasp out of his cabin. He told me to get out of there and stay out of trouble, which I did. Each duty station section is written from the perspective of rank held at the time. There are primarily three perspectives; pre-CPO years, CPO years, and CWO years. My opinions and reflections at the time are expressed from those perspectives. If you have any photos, comments, stories (funny or otherwise), etc. that you would like to contribute, they would be greatly appreciated. This web site not only depicts my tours of duty at these duty stations, but it is also a compilation of all the info/photos that I could find on these same U.S. Navy commands. Please come back again as I will be updating the site often. During my high school years, I was becoming increasingly disenchanted with the high school I was attending and the one-horse town I lived in. We had just recently moved from Yakima, WA to Arcata, CA and I wasn't adjusting well in my new environment. In addition, I wasn't getting along very well with my dad at the time. So, he suggested that I quit school and join the military. It sounded good at the time, so we headed off to the local military recruiting offices in Eureka, CA. The first recruiting office was the U. S. Air Force, and I had always wanted to join the Air Force. Well, they turned me down because I wasn't a high school graduate. I was only seventeen and in the middle of my junior year at the time. Quelling my disappointment, we proceeded to the next recruitment office in line, The U. S. Navy. Fortunately at the time, they would take just about anyone who could walk. I often wonder, if the next recruitment office had been the Marines or Army, would I have made a career out of the military. They bused me down to San Francisco, put me up in the YMCA, wined and dined me, poked and groped me, and swore me in. I thought hey, this military thing is going to be all right! So then, it was off to San Diego and boot camp. I enlisted with a high school buddy (Ken Harris), under the "buddy" program. He was discharged while undergoing recruit training - after a medical physical discovered a heart murmur (I believe). For some reason, probably more my fault than his, our friendship cooled during this boot camp stint. I often wonder what happened to him. Or, click On any icon under Duty Stations below.